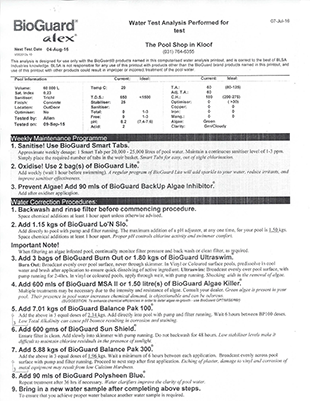 The computer software (Alex) used to drive the BioGuard Water Analysis program was specifically written to be used in conjunction with the BioGuard range of pool chemical products. After capturing personal information and pool data, an extensive Computerised Water Analysis is completed of your water sample supplied via a sterile water sample bottle. The results are printed out and both the Diagnosis and Repair Procedures or Maintenance Programs are explained to ensure a professional and effective approach in maintaining your pool. To view a sample of the ALEX BioGuard Water Test Analysis Report print out, to see the comprehensive tests conducted and procedural instructions, please click on learn more below. - maintain healthy water that is safe to swim in for the whole family. - protect the finish (marble or fibreglass) to provide longevity to the surface so as not to have to go through the significant expense of having to re-marble or re-fibreglass after just a short period. - maintain sparkling (aesthetically pleasing) looking water. For additional information on pool care and BioGuard Pool & Spa Chemicals and Maintenance Programs, click on learn more below.